The USS Gary. Photo courtesy of the U.S. Navy. 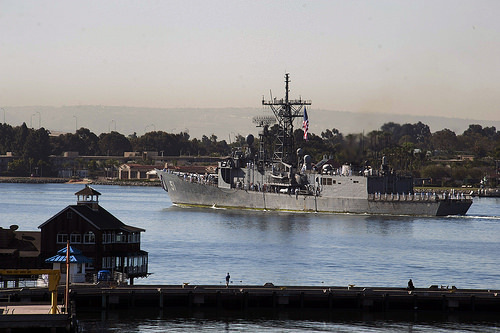 The last frigate on the West Coast will be decommissioned Thursday at Naval Base San Diego, the Navy announced Tuesday. The 31-year-old USS Gary returned to San Diego in April from its final deployment, in which it patrolled for drug smugglers off Central America. The Navy is retiring its frigate fleet in favor of more modern littoral combat ships, which are designed for combat in coastal waters. The last frigate to be decommissioned will be the Norfolk, Virginia-based USS Kauffman later this year, according to the Navy. The ship is named for Donald Arthur Gary, who was awarded the Medal of Honor for helping to rescue hundreds of sailors trapped below decks when the aircraft carrier USS Franklin was badly damaged after being bombed off the coast of Japan in March 1945. William Albrecht, a survivor of the attack and a recipient of the Bronze Star, is scheduled to deliver the principal address at Thursday’s ceremony, according to the Navy.